I'm probably as big a cheerleader as you'll find for New Zeland's unique and wonderful invertebrates. So, you'd think I'd be happy to see one of our insects make the pages (or the pixels) of the The Daily Mail, The Sun, Boing Boing, The Huffington Post, The Mirror, The Times of India, io9 and damn near every other blog and newspaper in the world. Instead, I've spend the whole time feeling like the grinch that stole the gloss from the headlines. The story, as it was presented in the tabloids at least, goes that an American tourist traveled to a remote island of the coast of New Zealand where he spent several days searching for a fabled giant bug before finally uncovering the creature and in the process breaking the record for the largest ever insect. The only problem with the story is that every single detail of it is wrong. The "American tourist" is, in fact, Mark Moffett, former curator of Ants at the Havard Museum of Comparative Zoology turned explorer and a constant feature in National Geographic and in various other media. Little Barrier Island isn't particularly remote; it's two hours boat ride from Auckland, almost always has scientific and conservation workers living on it and even has electricity provided by a solar panels. The insect in this photograph is certainly endangered, but it's apparently not very hard to find on Little Barrier. 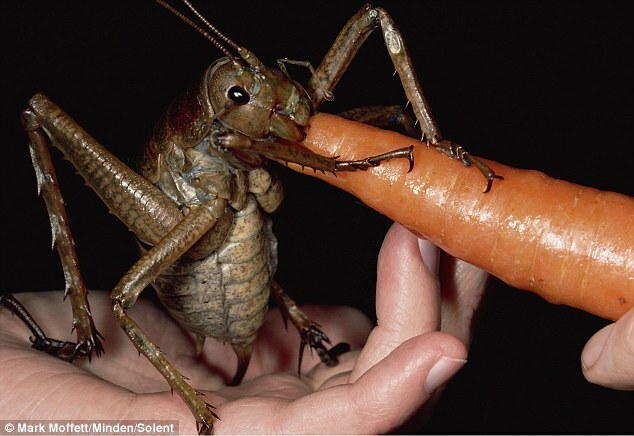 Most importantly, there is really no way that the insect chomping down on a carrot in this photograph is the largest insect ever recorded. The creature in question is a Giant Weta, wetapunga ("god of ugly things") in Māori and Deinacrida heteracantha ("mighty locust with differing spines") in Latin. Here in New Zealand, we give the name "weta" to a large and taxonomically diverse group of cricket-like insects. Most weta are relatively small, not much larger than what you might think of as a standard cricket. Even the small species have a way of freaking people out. Cave weta (called "camel crickets" in other countries that have them) often roost in piles of firewood - I don't know how many logs have been dropped on how many toes as a result of long antennae an spindly legs poking out form an armful of wood. Perhaps even worse, ground weta (like the hibernating one I recently disturbed) seek cool and dark roosts for the day time, so frequently sleep inside shoes, much to the alarm of those owners who blindly poke their toes into them and meet resistance. People that are scared of the smaller weta probably don't want to contemplate the eleven species of giant weta that make up the genus Deinacrida. The body of these species is about 10 cm long, and they have antennae and legs to add to that (they don't as io9 and several other outlets suggested, have a "wingspan", what, with them being flightless). Although the reporting of Moffett's "discovery" has made a lot about this being the biggest ever giant weta, it's been rather short on actual numbers. In fact, the one number that keeps coming up in reports is 71 grams. That's the current record for the heaviest adult insect, and it belongs to a Little Barrier Island Giant Weta, but there is no way the one in this photo can come close to it. In the wild, once weta have mated they move down from the trees in which they live and deposit their eggs deep into soil via that impressive "spike" they carry on their back-end (which is called an ovipositor). However, if you keep giant weta in captivity, unmated and with no access to soil in which to deposit their eggs, they just accumulate egg after egg after egg. The 71 gram behemoth that holds the current record was a captive female, which was retaining eggs and, so, quite unlike anything that would be crawling around trees on Little Barrier. In the wild females with eggs might be able to maintain a weight close to 40 grams. According to people who know, the female pictured with the carrot here isn't particularly big for the Little Barrier species, so there is no reason to think she approaches the record holder. I feel a little unpatriotic about this, but I also have to point out that even that 71 gram beast isn't the largest insect in the world. Goliath beetles (from the scarab beetle family) and the titan beetle (a long horn beetle) probably both beat the the local contender on this front. The internet is full of claims of adult goliath beetles weighing up to 100 grams, but this appears to be one of those fact-like-objects that are often repeated but have no basis in reality. David M. Williams, who has tried to get to the bottom of the largest insect problem, thinks it might be a result of the the reasonable metric measure "35 grams" entering an imperial brain as "3.5 oz". In fact, it seems adult goliath beetles probably weight in the order of 30-50 grams - quite likely more than the natural range for giant weta. The titan beetle is longer than the goliath, but it's not clear that these beetles are bulky enough to weigh more than the giant scarabs. What is clear however, is that the larvae of goliath beetles leave weta in the shade. These 13 cm long grubs tip the scales at around 80-100 grams. Scientists have yet to find the larvae of titan beetles, but they may well get even bigger. I struggle to see a good reason to restrict the "largest insect" to only adult forms, so I'm afraid the weta will have to lose that crown. I really do feel awful about being such a downer on this rare occasion of a New Zealand invertebrate getting some exposure in the worlds's press. I trust the poor reporting that came out of the story can be blamed on the tabloids that broke it and the other sources which ran it without doing any checks, and that it's not a case of someone trying to buy themselves a headline by flying into the country and spotting an insect they knew they'd find. Still, it's shame that the stories have been about the bogus "discovery" of this animal, and the claim that it's a record breaker, because there are plenty of good reasons to talk about giant weta. In many ways, these bugs are a prefect example of the wierdness of biology in New Zealand. Our islands are just isolated enough from the rest of the world that, for the most part, invasions from overseas are rare and the bulk of species that live here live nowhere else. Those species that do establish themselves need to adapt to unique conditions and interactions that come with life on our islands, and the results are often very strange indeed. Where else would you end up with the kakapo, a giant flightless parrot in which the males attract mates with a near sub-sonic "boom" that is broadcast up to 5 kilometers from its origin. Giant weta might not be quite as bizarre as the kakapo, but they are a huge flightless cricket that has adapted to life entirely in the trees - that's pretty cool. The giant weta exemplify another story that is too common in the New Zealand flora and fauna. The weta and the kakapo seem to have developed in a country that was free from large mammalian predators*, and so never needed to evolve ways to escape or fight off such threats. The introduction of mice, rats, stoats, weasels and possums to our naive ecosystems, and the massive habitat losses that came at the same time, have had a disastrous effect on our natural heritage. At least 60 species of vertebrate have become extinct since human settlement, and many more invertebrates will have past unnoticed. There are about 150 kakpo left, and only a few mainland enclaves and offshore islands play host to giant weta. Most of the other weta species are doing better than the giants, but they are still having to deal with predators for which their evolutionary history provides them no counter-measures. It's easy to look at the recent history of life in New Zealand and feel forlorn - I wish I had the chance to see a pair of Huia feeding or find a half-metre long gecko - but with the weta at least we have a chance to help. The giants need to be managed, and that means we need to make sure the Department of Conservation is funded to the extend that it can live up to its name. The main threat to the smaller weta species, at least in suburban settings, are mice and rats. Providing weta with a few roosting sites that are too slim for a mammal to squeeze into in your garden is enough to stack the odds in the insects' favour. The Department of Conservation even has plans that you can use to bulid your own weta motel. And for those that think wetas are just too creepy to help in this way - I'm sure providing them safe lodgings will keep them out of your shoes! You should check Mike Bok's great post on the biggest insects here and David Williams chapter on the same, discussed above. I'm not going to link to all the news sources that ran with the silly version of this story, by kudos to Alan Boyle at MSNBC and The New Zealand Herald for digging a bit deeper. *There are two endemic species of bat, one of which is adatpted to feeding on the ground but probably wouldn't take on an adult giant weta. There is also a 20 million year old fossil species of mammal that was probably more distantly related to modern placental mammals than marsupials are. We know precisely nothing about how this mammal, or its relatives made a living in New Zealand but the one that got fossilised was very small. Thank you, upon reading the Huffington post this morning I was rather annoyed by the whole story. I want one. I have an extra seventy-gallon aquarium, and I think this would a wonderful pet. That sounds horrible, but I would just love to be able to watch it move and grow. It truly is beautiful to me! I want a. I have an extra seventy gallons of fish tank, and I think it will be a wonderful pet. That sounds very sick, but I just love to watch it moves and growth. It's really beautiful, I!